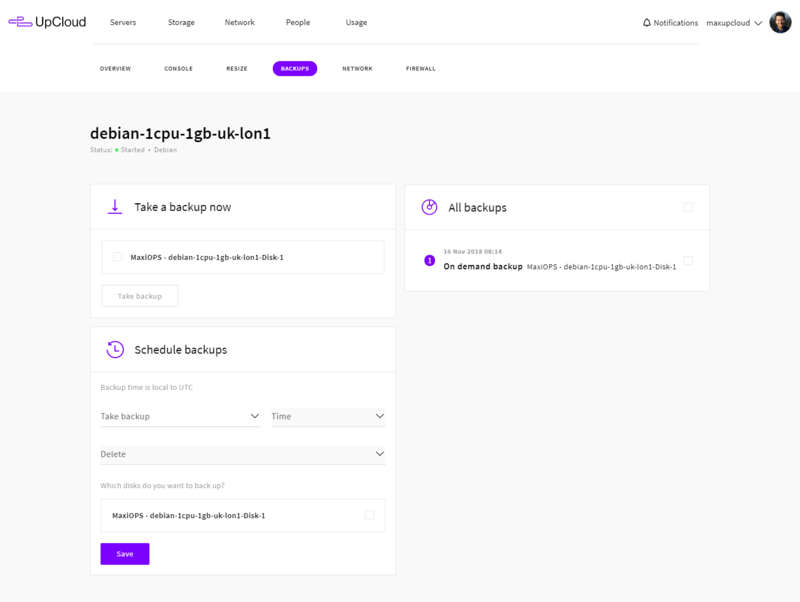 The UpCloud control panel offers two methods of taking backups of your cloud servers – instant on-demand backups, and automated scheduled backups. Both of these are configured on per server basis at your UpCloud control panel in the server settings under the Backups tab. We recommend taking backups of your cloud server before operating on crucial systems or services. This way you will have an option to revert possible unwanted changes. The simplest way of taking backups of your storage disks is to use the on-demand option to take an instant backup. 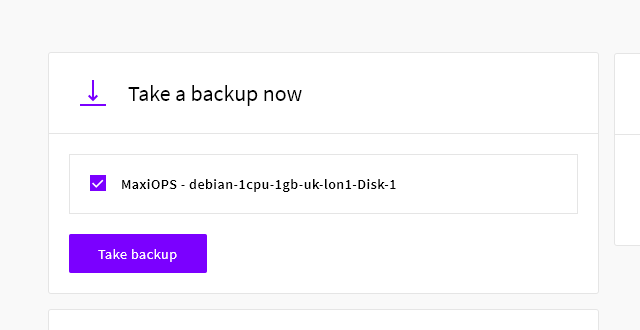 Taking a manual backup of your server is easy and happens in a flash. First, select the disks you wish to backup. Then click the Take backup button below. Once the process is complete, you’ll see the new backups on the list of All backups. Backups will show the time and date of when it was made, what storage disk it is from, and whether it was done manually or by a schedule. If you are often making changes to your cloud server or for example have a constantly updating database, consider configuring scheduled backups. They offer an automated option for keeping a version of your storage just in case you might need to restore a file or even roll back the whole server. And finally, click the Save button to confirm the changes. Be sure to select an appropriate schedule for the automatic deletion to prevent the feature from keeping unnecessary backups of the same data. As all storage, each backup is priced by the disk size, so optimising the backup retention can help save on costs. See more about the backup pricing below. Note that the manual backups are excluded from the automatic deletion feature which allows you to make important backups for safe keeping. Remember to delete these manually when they are no longer needed. Backups are nice to have, however they would be of little use without an easy way to restore from them. Fortunately, a storage disk can be restored from a backup with a couple of steps at the server settings under the Backups tab. Read our guide for restoring backups which including methods of complete disk restore, or bringing back single files on both Linux and Windows environments. The pricing for backups is calculated similarly to all other storages. Each backup is a carbon copy of the disk it was taken from including the size, and priced accordingly at $0.056 per GB of storage per month. We recommend configuring scheduled backups with a short retention time for the most cost-effective solution. You can find the full details on our pricing page. You haven’t specified it. Are the backups stored offsite? Thanks for the question, the initial backups are stored at the same location to ensure fast restore but physically separate from your server storage. However, the backups can be manually copied to another location if you wish to further secure your data. 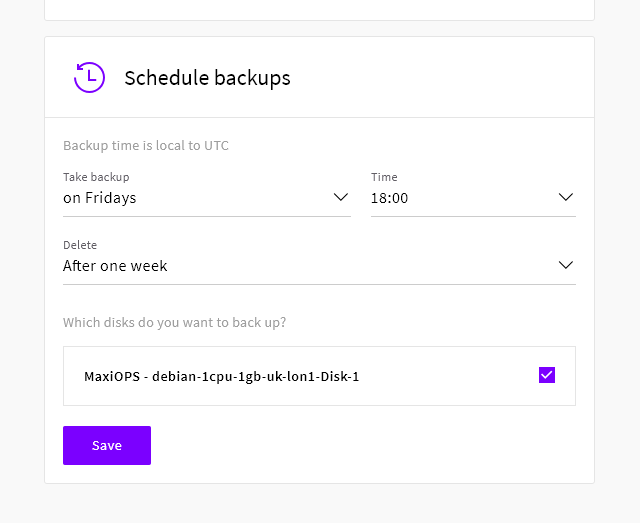 Would scheduled backups be incremenetal or is every scheduled backup a full backup? Hi Stephen, thanks for the question. Each backup is a full snapshot of the target storage device. The backup process is incredibly fast and a full backup then allows easy restore if ever needed. Is it (or will it ever be) possible to compress automatic backups, to avoid paying for as much space? Hi Kelvin, thanks for the question. There isn’t currently a feature that would enable compressing backups. Each backup is a full snapshot of the storage device but at a lower cost than server storage, $0.06 per GB per month. You can optimise the backup costs by configuring the automatic backup retention time.